Katerinchuk addressed the crowd with “Glory to Ukraine!,” to which they answered with the traditional “Glory to heroes!,” RT's Irina Galushko reported from Odessa. “We don’t ban anybody from peacefully demonstrating and expressing their opinions. But we are against those who are promoting separatism and the splitting of Ukraine. I think that is where we are united,” a YouTube video shows Katerinchuk saying in Ukrainian. “But that does not mean that we should break the law,” he added. 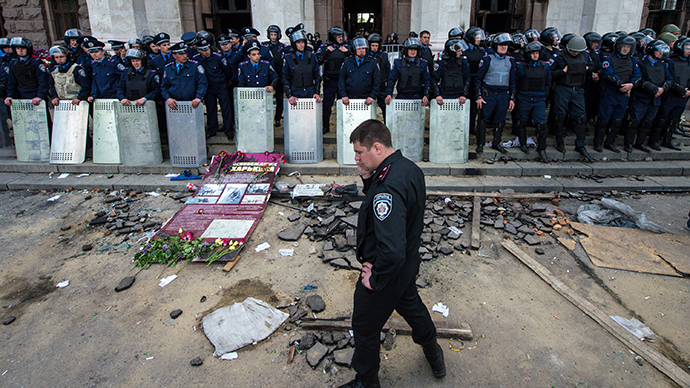 The new police chief received his position on Sunday, following Friday’s disastrous events in Odessa. After being appointed, he announced that the priority of police would be to avoid additional clashes. The police chief was born in western Ukraine. He has worked with the police since 1983 and resigned from the force in 2010 after holding various leadership roles. 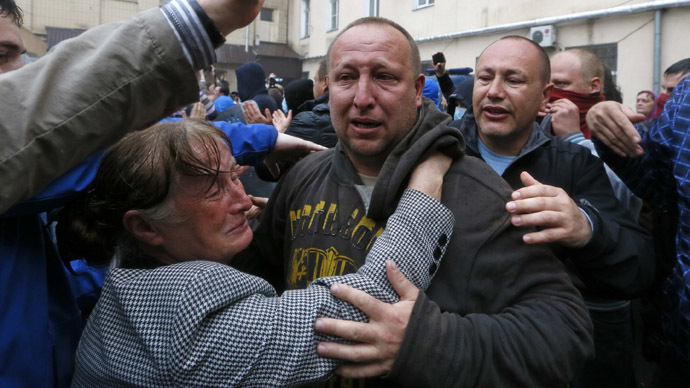 His last position was as police chief in Ukraine’s Chernigovskaya region, located in the northwest of the country. 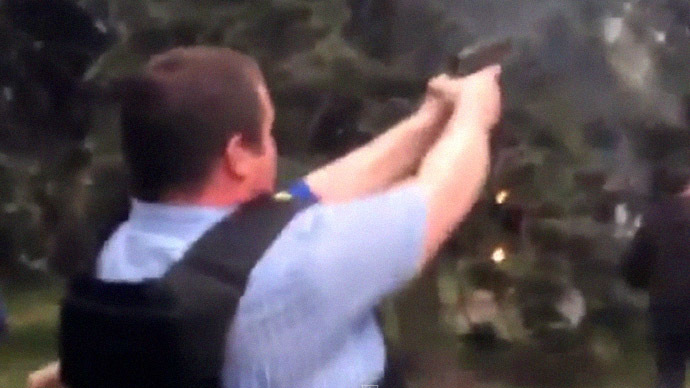 The same video footage showed that one of the attendees of the rally was the same radical that was shooting at the windows of Odessa’s burning House of Trade Unions. 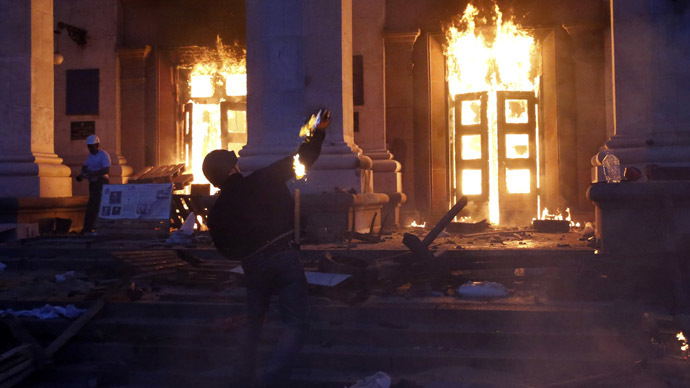 On Friday, dozens of people died in flames in Odessa, when radicals set ablaze the local House of Trade Unions with anti-government protesters trapped inside. The city is now in mourning for those who died, many of whom suffocated from smoke or jumped out of windows. Around 100 people rallied in central Odessa on Sunday after blocking the local Interior Ministry department in a protest against the detention of anti-government activists following the tragic events on May 2. The protesters have been trying to prevent police from sending the detained, which reportedly include dozens of survivors of the Trade Unions House fire, to the regional court building. The accusations were not backed up by any evidence. 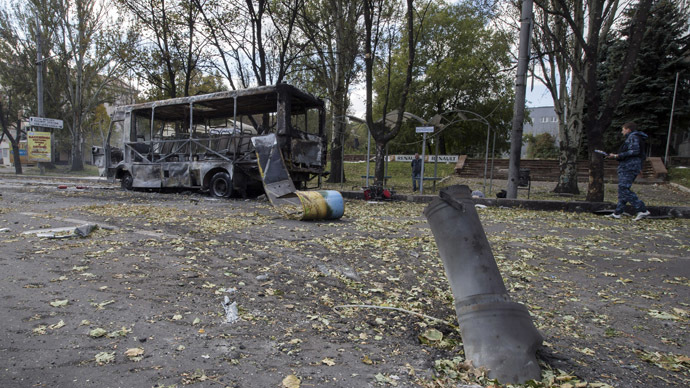 In fact, US ambassador to Ukraine Geoffrey Pyatt said on Sunday that his country does not have evidence linking Russia to the tragic events in Odessa.